One of Buku’s four taboo inspired characters that may be seen on the festival grounds. While their apparel varies, the characters will often wear the same hat or mask. New Orleans is infamous for its round-the-clock nightlife, vibrant live-music scene and festive spirit. The food, fashions, and people of New Orleans are all extremely diverse and intriguing, reflecting the cities’ history as a melting pot of French, African and American cultures. The well-known carnival, Mardi Gras, famous for raucous costumed parades and public partying comes to this city annually during the month of February. A few weeks afterwards comes Buku Music + Art Project- one of the city’s most thriving music festivals with a culture of its own. “BUKulture” is what the creators of this event refer to as the “new” New Orleans. BUKulture is all about creating genuine experiences with 100’s of installations, interactive elements, and non-traditional performances. The event encourages attendees to discover and express however they feel. Buku Music + Art Project features live music, local art installments, and famous creole food vendors. Most importantly, the festival is filled with culturally influenced, and unique fashion that can only be found at a New Orleans festival! Many individuals and groups of friends that come to Buku all have their own take on this fashion and culture collision. A male festival go-er dons a unique hairstyle and rhinestone stickers that were distributed for free by event volunteers. This wall was black when attendees arrived at the festival. When they left, every wall had been graffitied. NuViews fashion writer, Jacqui Simes, personally attended the Buku festival and was able to conduct style related interviews with a few festival goers! An interviewee stepping onto a graffitied cargo truck, dressed in comfortable, bohemian festival clothing. What brings you to Buku festival? I love the vibes and diversity this city and festival has; you can feel it before even walking inside that everyone is here to celebrate life, music, art, and just being yourself. This is my third year in a row to come to Buku and I plan on coming back every year because it just keeps getting bigger and better. A group of men play impromptu jazz music. Men with the masks have the time of their lives sharing cultures and unique styles. 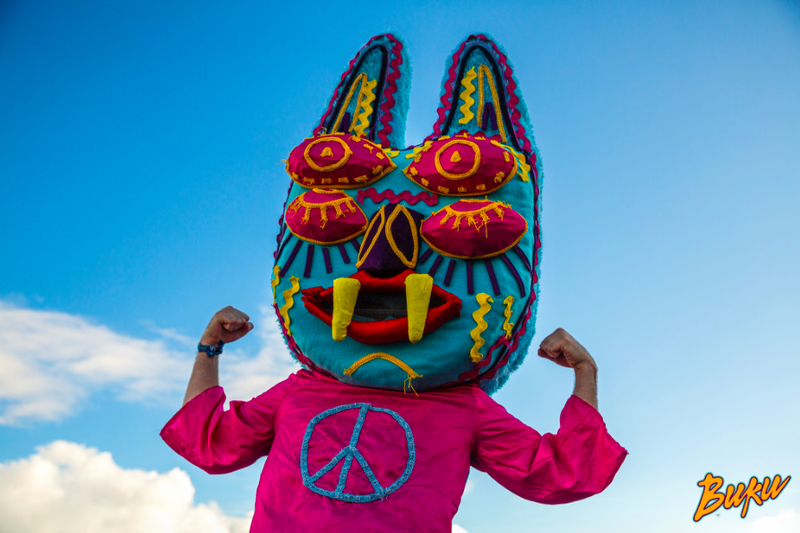 What motivated you to wear these animal masks in the French Quarter before heading to Buku? Just because they’re different. My friends and I wanted to stand out and we’ve seen these being sold all around New Orleans and just went with them. Our goal is to not lose them before we walk over to Mardi Gras World for day two. We love it here. How did Buku Festival influence what you chose to wear today? I wanted to wear something comfortable and “free-feeling”. These graffiti cargo trucks that Buku provides as a place to rest or hang out in-between music performances is definitely my favorite spot I go to every year[.] [This is where I go] to eat some good food and meet new people. So, I chose this kimono I found at a boutique in New Orleans because it reflected this spot to me[,] with the vibrant and free-style pattern. The lace top I chose just because it’s light and fun. How would you describe the style you ladies created and your main motivation behind it? The "go-go glam girls" stand out in amazing, coinciding outfits. We call ourselves “the go-go glam girls” and all met in college years ago. Since then, we’ve traveled to many cities and festivals together. [We] like to create new outfits to wear each time, because creating new looks is fun and we love to stand out. This time we were inspired by the festive culture of New Orleans and the vibrant glittery environment Buku creates every year, but we wanted something more comfortable than what we usually wear, so we chose spandex pants and made our embellished tank tops last week. Do you find fashion/style inspirations from other festival goers, or is originality important to you when creating your outfit? We love seeing other groups of people and [the] styles they bring to the festival, but originality is most important for us. When we create our outfits we always stick to the main idea of wearing something that is “festive”, but we definitely don’t want to look like any other people here. Buku is different though. More colors, paints, and embellishments seem to be more prevalent in New Orleans so we kept the culture that’s inside and outside of Buku as our main focus for these outfits. College guys show off their tropical shirts and matching fanny packs while at the festival. What brought you to Buku? We all go to college together in Florida and wanted to make a trip out to New Orleans for spring break. We’ve heard about Buku many times from friends at school and finally got the money to come out here and see what it’s all about. Would you consider the look you are wearing today defines your everyday personal style? Yes, and no. Our shoes obviously were worn because we knew they’d get trashed since it rained a few days ago, and there’s thousands of people here all trying to see the same performances. [My friend and I] chose to wear tropical shirts because it’s spring break, and the vibes we feel here are free and welcoming. Most of the other stuff we’re all wearing is just normal clothes we brought to feel comfortable in. We did all coordinate our fanny packs though. We knew we wanted to use fashion, and something we [wouldn’t normally wear] to bring our group together and separate us from all the other festival goers. Two fun ladies pose by an apparel vendor at sunset. How would you describe your style, in one word? What subculture do you most identify with in regards to fashion styles here in New Orleans? The Mardi Gras subculture, for sure. The wide assortment of costumes worn here during that time, and quite frankly worn year-round by many people here, is so inspiring and fantastic! There’s nothing like it. Just the combination of friendly people, colorful sights, beads, flowers, glitter... it’s all incredible. We’ve both attended Mardi Gras numerous times and the streets just come alive with an energy and culture that is beyond description. Since Buku takes place here at Mardi Gras World [where all the famous huge floats for the parade are made] we get to see the Mardi Gras floats all around us. Buku allows us to be ourselves and bring that subculture into a festival that has a culture of its own. A positive and energetic girl wears handmade accessories while seated inside Tropical Isle on Bourbon St. during the St. Patrick’s Day parade. Well I consider myself a “candy-kid” so I make all of these accessories at home with my rave friends, and we decided to make our new candies for this year to be big and bold like Buku is. I’m wearing some Mardi Gras beads I bought at one of the stores off of Bourbon St. last night and incorporated them into my own collection of candies that I’m wearing today, which include many of my own and also a variety of other candies that I’ve traded and received from other candy-kids at previous festivals around the country. I keep adding on to my collection and this year I took a lot of time to make this large candy that says “Buku” because not only is it a one-of-a-kind necklace, but it also coincides with the Mardi Gras culture of beads. What fashion based store or boutique do you find inspiration from in New Orleans? Well a lot of the vendors inside Buku have plenty of items that I obsess over, but one store that does not have a vendor table and can be found only on Bourbon Street is called “Marie Laveau’s House of Voodoo”. There’s so many cool things [derived] from different cultures. I love the subculture of Voodoo in New Orleans a lot. It’s so unique. Overall, the fashions seen in New Orleans and at Buku cannot be grouped into one style because here it is less about trends and more about just feeling good and standing out. This celebration of culture and individuality is reflected in many local boutiques. New Orleans's street style is just as eclectic as the city itself: vibrant prints mixed with delicate details, and masculine boots paired with chic accessories. Many stores offer a huge variety of well-known New Orleans accessories such as beads, feather boas, and masquerade masks. If you plan on making a trip to New Orleans, Buku festival, or would like more information on any of the fashions and boutiques there, then here’s links to help you get prepared or involved!